Does your kitchen look like your neighbors? 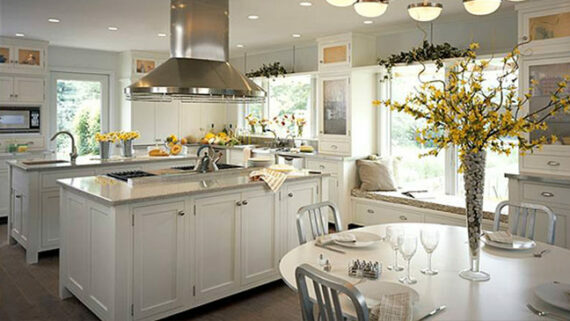 Does your kitchen feel outdated and lack luster? If you answered yes to either question, it may be time to consider remodeling. If you are ready to step it up a notch and update your ordinary kitchen, there are many different options to choose from. Updating cabinets is one of the best ways to give your kitchen a new look. Make them the center of attention when friends and family enter the room. 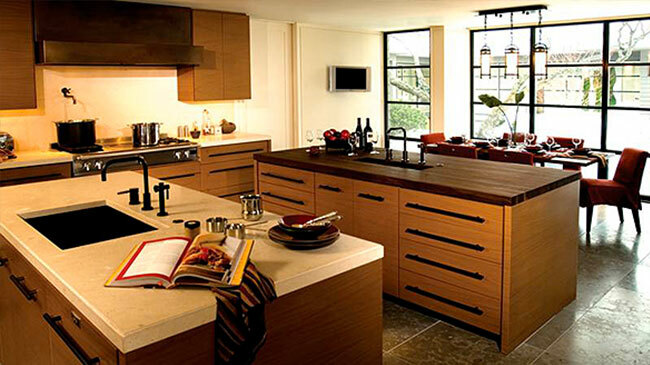 Consult with a professional to give your cabinet layout the most efficiency. They will also be able to design the layout so it is esthetically pleasing. Often, taller cabinets will be placed between shorter ones to give the room more dimension. There are numerous styles and colors to choose from in many budget ranges. This article suggests adding crown molding to the cabinets for a finishing touch. There are many different ways to incorporate molding in your cabinetry. It can be added to the bottom, edges, and around the base. The list of flooring options is unending, but choosing one that coordinates well with your cabinets is a must. If you have a lot of space in your kitchen, larger porcelain or ceramic tiles are a good choice. If your space is on the smaller side, you may opt for a plank style flooring. The ceramic and porcelain tile of today have the look of wood planks, without the maintenance. Brick flooring is also a stunning option, but you need to be sure that it is sealed well to prevent staining. Genuine hardwood floors are an excellent investment. The richness of the wood makes the room feel cozy and inviting. Tile pattern is also another way to give your kitchen an upscale appearance. Placing the tiles or planks at an angle or by creating a herringbone pattern from bricks is an excellent design technique, which gives the room texture. Amazing countertops can be created out of many types of stone, such as marble, granite or quartz. The natural markings and sparkles from the stone are incredibly beautiful. If you are going for a more industrial look, consider a concrete countertop. These counters can also be created to look like actual stone and is an excellent alternative to a more costly material. If you have the space to spare, consider adding a gourmet island to your kitchen. Many islands can accommodate a stove, so your preparation area is increased. Alternatively, a sink can be included with the island, then a pot filler faucet is also placed in the wall above the stove. Additional cabinets is also a plus, as well as increased seating areas for quick meals and homework. The extra counter space that an island provides works well when hosting parties and family gatherings. Replacing outdated light fixtures with current styles makes a big difference in the appearance of a kitchen. LED lights can also be run under cabinets above the countertops for additional light and ambiance. If your kitchen is lacking in natural light, consider cutting out a window. If that is not an option, strategically placed can lights can also brighten up the room. By implementing the ideas above and incorporating your own style, you can transform your current kitchen into one of your dreams. It is always best to consult with a designer who can direct you to the various options available. New products and styles are always evolving. Get ahead of the game and create the kitchen that everyone else is talking about. For further reading, check out: 8 Amazing Ideas For Kitchen Storage and 6 Backsplash Ideas That Are Easy To Clean.